My husband and I had oranges in the house and they were about to go bad so I thought I’d try to dry. I’ve never tried to dry fruit before so I turned to the “all knowing” internet. There are actually a lot of techniques for drying oranges slices but I turned to Martha Stewart. I mean she would know best, right? I loved the way they came out because they have a shiny sheen and bright orange color to them. I would definitely bake them this away again in the future. 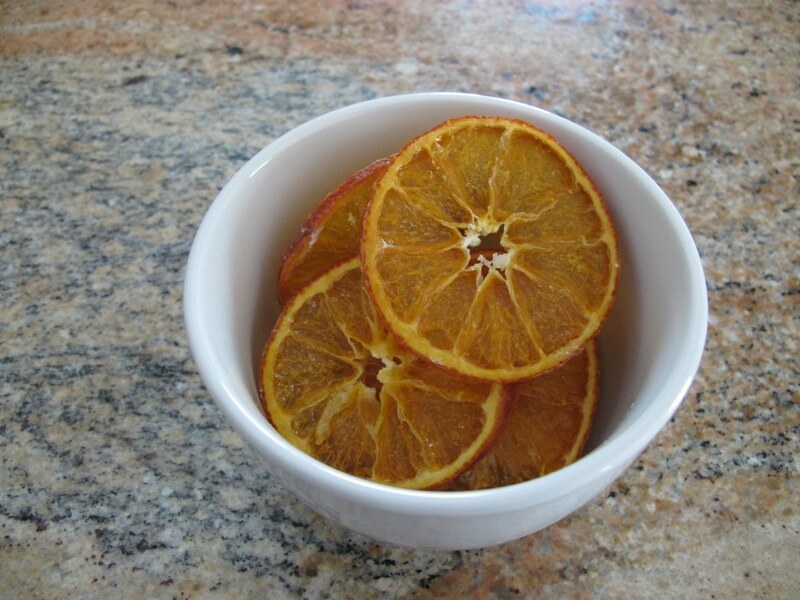 The orange slices look great in a bowl for a little touch of color in my kitchen decor. However, I’ll probably throw them away when it gets warmer out. I’m thinking that since the orange slices are covered with sugar, they may attract bugs. Alternatively, I’d definitely use this recipe as a food garnish for drinks (like Martha has shown on her website). Lay orange slices in a single layer and dust with sugar. Bake until the peels are dry and the flesh is translucent, about 2 1/2 hours. Turn off the oven and leave the orange slices in there until the oven is cooled (about an additional 1 to 2 hours). Take them out of the oven and leave the orange slices on the tray overnight to cool and harden even more.